Google Apps professionals like you save an hour every week as they no longer have to copy/paste contact details. 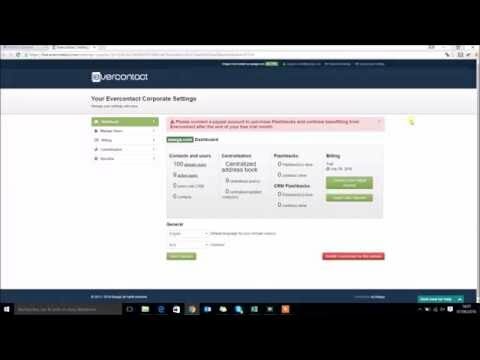 Evercontact automatically updates their address book and CRM contact details by analyzing email signatures in incoming email. #1 Contact Management App in Google Marketplace and you'll be impressed by a 30-second integration with Google apps, and then the amazing seamlessness of Evercontact as it runs 100% on its own and in the background. Join more than 100,000 users in 100+ countries now and take advantage of team discounts for 5+ users. 30-day free trial with no CC. Great software to keep track of contacts details.After you have installed Evercontact you can sit back and all your emails contacts details will be added automatically to your address book. This is a great service. After you have installed Evercontact you can sit back and all your emails contacts details will be added automatically to your address book. This is a great service. It would be great if Evercontact could add a complete address book on the users Evernote dashboard. Many thanks for taking the time and for the thorough review, we appreciate it! Greta feedback too. Definitely want to find a better way to show the value of ALL the work Evercontact does, not just a snippet of the last 50 updates. I have to go in and delete salesy contacts. But that is a small price to pay for not having to do keystrokes in my end. Overall, this is a great add-on to my contact and network management process. I like that it works in the background to gather and update contact information based on my email traffic. I'm not 100% sure that it's picking up all of the contact information, and while I could probably dig deeper into their documentation, it's not clear exactly how to set it up to make sure everything is covered. Great question and you can always log-in to your dashboard (or view contacts in your email provider) to get a look at the work Evercontact has done. I haven't figured out a way to allocate the new contacts to e.g. Google Contacts groups. Not sure it's possible without undermining the passiveness that I love, so this isn't a complaint. It's passive. I don't do anything, and I find new contacts appearing in my Google Contacts and hence my phone. I love it when I've received an email, done nothing myself and then the person calls and I know its them. It's passive. I don't do anything, and I find new contacts appearing in my Google Contacts and hence my phone. I love it when I've received an email, done nothing myself and then the person calls and I know its them. A million thanks for the review! Great to hear the positive feedback. We definitely strive to be a "set it and forget it" tool. Will investigate on a groups solution. Evercontact updates my contact records from emails I receive. It works very well. Keeping my contact list info up to date.I like the way Evercontact updates my contacts based on their email signatures. It runs and does it job very well. I like the way Evercontact updates my contacts based on their email signatures. It runs and does it job very well. No way to use it to manage my contacts. It only shows the last 50. Also, I would like to be able to scan business cards and add contacts that way. Thanks a million for taking the time to review Evercontact! Great callout on the business cards, something to think on. Lastly, as a heads up, you should see all of the contacts we've updated for you in your email client if you go to Contacts. Team plans range from 5$/user/month to 16$/user/month with CRM. Lead Generation in your CRM database! Below are some frequently asked questions for Evercontact. Q. What type of pricing plans does Evercontact offer? Q. Who are the typical users of Evercontact? Q. What languages does Evercontact support? Q. Does Evercontact support mobile devices? Q. Does Evercontact offer an API? No, Evercontact does not have an API available. Q. What other apps does Evercontact integrate with? Q. What level of support does Evercontact offer? Q. Which apps is Evercontact compared to most often?